WASHINGTON ― The Pentagon has continued to take steps to defend its military bases against extreme weather despite direction from President Donald Trump to stop preparing for climate change. In March, President Donald Trump rescinded all climate-related federal agency actions directed by President Barack Obama. The Obama-era initiatives that were killed included one that directed the Pentagon to plan for a future where storms, like this week’s Hurricane Irma, are a frequent factor in the Pentagon’s operations. To meet Obama’s order, the Defense Department published a “climate change roadmap” in 2014 and launched a defensewide review of its installations to identify vulnerabilities. “Hampton Roads region in Virginia, which houses the largest concentration of U.S. military sites in the world, we see recurrent flooding today, and we are beginning work to address a projected sea-level rise of 1.5 feet over the next 20 to 50 years,” the roadmap concluded. In January 2016, DoD issued directive 4715.21, “Climate Change Adaptation and Resilience,” which among other things implemented the 2014 roadmap. Yet the 2014 roadmap was invalidated by Trump’s March 28 executive order, the Pentagon said. It is also now reviewing directive 4715.21, “to determine if it should be suspended, revised, or rescinded,” Pentagon spokesman Lt. Cmdr. Patrick Evans said. Still, Trump’s executive order has not stopped the military from preparing for climate change. The DoD has found space to maneuver by separating the argument of climate change from the threats that more extreme sea states, wind and flooding can generate. Essentially, the DoD is moving forward by leaving the semantics of climate change to others. The Pentagon spokesman said that is what the Pentagon’s doing. Hampton Roads is home to more than 60 of the Navy’s ships, including six aircraft carriers: the Harry S. Truman, Dwight D. Eisenhower, Abraham Lincoln, George Washington, George H.W. Bush and Gerald R. Ford. 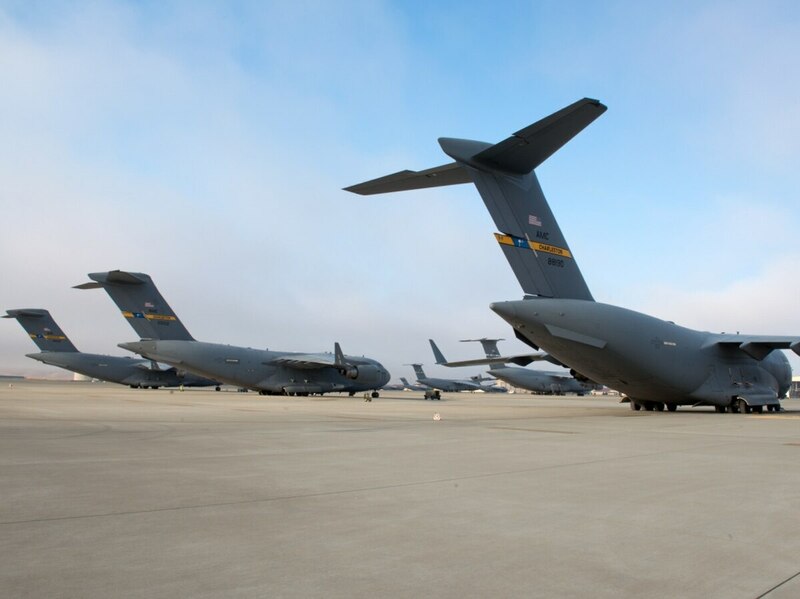 Hampton Roads has hundreds of fixed-wing and rotary aircraft and more than 83,000 active duty military. Naval Facilities Engineering Command Mid-Atlantic, the command responsible for ensuring Hampton Roads is ready for those storms, hasn’t stopped fortifying the installation for future extreme weather. Another part of the now invalidated roadmap was the DoD’s assumption that a growing part of its operations would become response to weather disasters. By Sept. 11, more than 17,000 military personnel and several Navy vessels were positioned to assist with relief efforts in the U.S. Virgin Islands, Puerto Rico and continental United States after Hurricane Irma tore through the region and left about a third of Florida residents without power. And as of Sept. 6, approximately 20,000 personnel ― including about 3,000 U.S. military and 16,000 members of the Texas National Guard ― were involved in relief efforts following Hurricane Harvey, which made landfall Aug. 25 and dumped nearly 50 inches of rain on southeast Texas. The military also moved critical aircraft and ships out of the way of Irma’s projected path. At Shaw Air Force Base in South Carolina, for example, the Air Force sent 50 F-16 fighter jets away to better protect them, base spokeswoman Lt. Alannah Staver said. Shaw’s hangars have withstood previous storms, including Category 5 Hurricane Hugo in 1989, Staver said. Hugo buffeted Shaw’s hangars with 109 mph winds and the hangars held on, she said. But the Air Force wanted to disperse its fighters to avoid the risk that storm damage could make the airfield inoperable. When Harvey made landfall last month, it hit just north of two critical Navy flight training bases on the Texas coast. Naval Air Station Corpus Christi, which is located on the bay, spent the day before landfall trying to take some preliminary measures to protect their offices from what was anticipated to be a direct hit and 12-foot water surge. They put computers high on desks and cleared out any debris from base drains to help water clear faster. Then Harvey turned upward at the last minute, and NAS Corpus Christi only had minimal damage. But the base is now putting together lessons learned to see what parts of the installation should be strengthened for the next hurricane.